Take a break from the stressful, noisy city life and explore the exotic island of Bohol, which is situated in Central Visayas in the central region of the Philippines. You can go there either via air or sea travel. The airplane trip will take about one hour and twenty minutes from Manila; whereas the latter will consume as long as 29 hours. #1 - Enjoy water sports in Panglao. Find a wide selection of beach resorts from this municipality of Bohol, which is 18 kilometers from Tagbilaran. You can experience snorkeling, kayaking or diving there, as well as bask in the warm sunshine while swimming or sunbathing with your loved ones. #2 - Visit our Tarsiers. Tagged as one of the world’s rare species, these so-called, smallest monkeys, are so cute, with bulging eyes and are capable of doing a 360-degree turn with their head without getting themselves injured in the process. Astonishing! 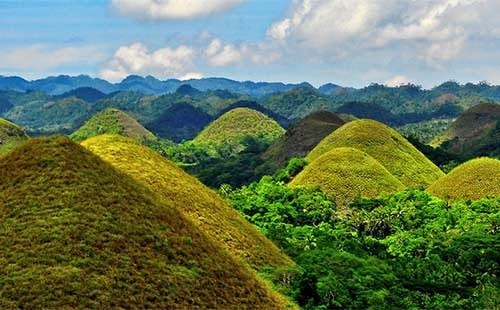 #3 - Marvel at our Chocolate Hills. These grass-covered limestone hills are also known as our natural geological monument. Their highest concentration can be found in the municipalities of Sagbayan, Batuan and Carmen. The grass turns brown during the dry season, and thus, they are called as such. Be ready to take your selfies here! #4 - Watch the dolphins and whales. View and love these sea creatures, while they playfully swim around in the waters of Panglao and Balicasag islands. Make this memory with your spouse, family or friends through availing guided tour arrangements in the Panglao resorts. Truly a must-see! #5 - Hop onto a dinner cruise in the Loboc River. Delight in your buffet lunch while riding this floating restaurant and get mesmerized with this refreshing set up as you tell stories with its crew and your loved ones about your exciting Bohol getaway. Recent rate is just about Php 450 per person. Bon appetit!